Hey hackers! Before diving into the meat of this newsletter, I first want to thank all of you who send us emails regularly and who answered our questions on which topics you would like addressed in a podcast. I haven’t yet had the opportunity to answer all of you. But your input, queries and suggestions are well received and will be taken into account. Keep’em coming! 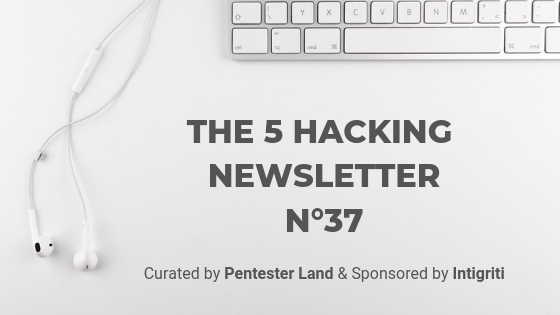 That said, here are our favorite resources shared by pentesters and bug hunters last week. This issue covers the week from 11 to 18 of January. Big thanks to Intigriti for sponsoring this newsletter! This is a URL shortening service. What’s great about it is that it supports any protocol (file, gopher, etc). So it can be useful to test for SSRF or open redirects, and bypassing filters on certain URI schemes. It was only possible to configure Burp as a transparent proxy because the app didn’t use certificate pinning. Are you submitting bugs for free when others are being paid? Welcome to BugBounties! If you’re interested in bug bounty, this is an absolute must read! @zseano, a confirmed and experienced bug hunter, is denouncing some bad practices from bug bounty platforms. For example, some companies have a paying private program and a public one with the same scope but no rewards (kudos and Hall of Fame only). He surprisingly concludes by saying that “bugbounties are overhyped and not sustainable” and that you should only do bug bounty as a hobby, not full time. He himself counts on quitting full-time bug hunting this year. Whether he has an ulterior motive or not, one thing most people would agree on is: don’t work for free, your time is too precious. Tip 2: Sending lots of requests in Repeater and looking for specific text in the response? Use the find bar but also click the “+” and select “auto-scroll to match when text changes” to jump straight to what you want! I love these Burp tips by @yppip. They might help you save time and avoid doing repetitive actions like loading your payload files manually every time. And if you want to see more tips of this kind, @Agarri_FR has ~100 pages of them: video & slides. They date back a little but a lot of them are still valid. This one is for you if you dream of becoming a pro pentester or bug hunter and have absolutely no idea where to start. It’s a short list of resources sorted by different categories: web, networking and programming basics, XSS and labs. These are not exhaustive resources, rather basics to master and get a solid foundation as a start. Getting Into Infosec: Marcus Carey - Childhood Builder/Breaker to Navy Cryptologist to Founder and Mentor: Covers acing interviews, negotiating salary, gaining new skills, learning faster, hacking back, finishing degrees faster, and other life hacks. Recommended if you want to get into infosec. TrustedSec Podcast Episode 3.7 - Intelligence and an End to USB Espionage? Let’s pwn a chinese Web browser! A password protected PHP web shell with the ability to run arbitrary functions with arbitrary commands in just 35 characters! Exposed JIRA server leaks NASA staff and project data! See more writeups on The list of bug bounty writeups. Resolve_domain_computers.py: Get /etc/hosts entries for computers in Active Directory. Useful for internal pentests when for whatever reason you can’t configure your box to use their DNS server directly. It uses domain creds to grab a list of hostnames from a DC, resolve their IP addresses, and gives you /etc/hosts entries. What is IoT and How Do We Secure it? .gov security falters during U.S. shutdown: More than 80 TLS certificates used by .gov websites have expired without being renewed because of the ongoing U.S. federal shutdown. So dozens of government websites either became insecure or inaccessible (due to HSTS being used). Women’s Immersion Academy 2019: Here’s a scholarship to get #cybersecurity training and certifications! Firefox to disable Flash by default: Adobe Flash Player will be disabled by default in Firefox 69. Adobe itself is killing off Flash in 2020.